When Georges and his family move in to the building, and he's urged by his father to meet some new kids, he’s not sure he wants to make any new friends. But a sign in the basement announcing a “Spy Club” sounds like fun. It turns out to be run by a boy his age named Safer. Safer’s a little strange, spending the day watching the building’s other tenants and spying on them. He convinces Georges that one of the tenants is actually a murderer and recruits Georges to help him uncover the crime. Meanwhile, Georges struggles at school with bullies, with missing his Mom who’s stuck at the hospital where she works, and the whole relocation. But Safer’s adventures provide him with distraction and escape until Georges learns that things aren't exactly the way safer has presented them. 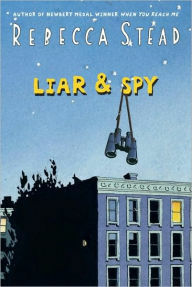 Liar & Spy is a compact story with a lot of twists (perhaps a few more than were actually necessary). It's a fun read that explores what I'll call the purpose of truth and the value of lies. If that seems an unfairly cryptic summary, it's still the best I can do without providing spoilers. I found it original and fascinating, in a way that Stead's books often are.